Espionage fiction is hotter than ever, as evidenced by the phenomenal success of Daniel Silva, Alex Berenson, and Ted Bell—and Andrew Kaplan plays the spy game as well as anyone out there. 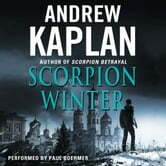 Following his stunning thriller, Scorpion Betrayal (which superstar author Harlan Coben called, “one of the smartest, swiftest and most compelling spy novels I’ve read in years”), Kaplan plunges his tough, code-named intelligence operative into the dangerous fray once more in Scorpion Winter. The ex-CIA agent-turned-freelance spy is on assignment in Russia, disturbing a hornet’s nest of assassination and political intrigue that could erupt in all-out global war in this electrifying espionage thriller that will enthrall Robert Ludlum, Brad Thor, and Vince Flynn fans.